It’s that time of year again where Apple gives us a glimpse of what's in store for their products in the near future. A show all about software, Apps and Updates, to make your current devices run slow, enticing you into the upgrade culture that is Apple. Next month (July) marks the App Stores tenth birthday. The app store is the world's largest app marketplace, with 500 million visitors, per week, bringing in a colossal $100 Billion. iOS11 supported devices “as far back as 2013's iPhone 5s”, which wasn’t really that long ago, to be honest, and then Craig Federighi compares this to Android, who are mocked for not having an updated model. Notably, Craig doesn't point out that the iOS updates are adding features that Android has already had, for several years, and supports devices dating back a lot further without bogging the phone's hardware, but I digress. 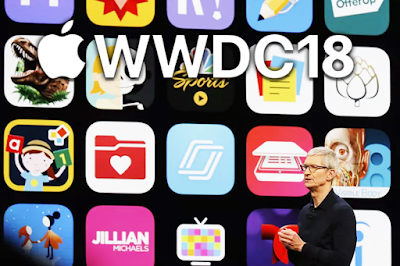 This is all about iOS12, with promises of doubling down on performance, for older models. He’s slightly vague on what he means by this but said it's supported by anything that could run iOS11 with a focus on the oldest (2013) devices. iOS12 will help older iPhones, like the 6 plus, launch Apps up to 40% faster and the keyboard to be displayed up to 50% faster, while the camera, which was already pretty good, will be accessible up to 70% faster. Gotta go fast. -Augmented Reality (AR) A new smaller file type, called USDZ, has been created; supported by most of the big name 3D software developers. AR essentially allows you to play out the Ikea scene from Fight Club, in real life. I got to play a few iPad AR games, back at EGX, and they were quite cool. I'm interested in where the tech can go as it develops at a rapid pace. Lego are onboard with Apple's AR dream, turning Lego sets into an Augmented Reality Sim like Bullfrog’s old Theme Park games. I can see this being big with kids. -Photo Apps - New recognition technology is a bit scary. Recognising your pets, friends and inanimate objects, for ease of searching and tagging them in the pictures. -Siri is capable of using new shortcuts and the shortcuts app allows you to essentially macro a bunch of App commands together and make custom shortcuts for your own convenience. Siri also attempts to take over your life and starts predicting suggestions based on your daily habits. “Time for your morning coffee, Dave”. -Ibooks has dropped the “I” and is now called apple books. -Car Play, For safe hands-free, while driving, is now compatible with third party Apps, so Apple users no longer need to get lost with Apple Maps. -Measure is a new app that lets you measure objects in three dimensions and will automatically detect rectangles. Good if you’re going travelling, I guess. -Screen Time will keep track of how long you spend on your phone and which apps are sucking up your time and making you a slave to your devices. Seems like a decent idea as a parental control. -Memoji allows the user to create and use their own face, as an emoji. Sounds like Mii universe and looks like an Xbox avatar. I know someone who’s going to love this. How long before its possible to use someone else's face, in real time, and frame them for things. There’s a lengthy live demo of how emojis work... (No wonder this conference is over two hours long). Went and made a drink. Came back and it was still an emoji demo. With the power of iOS 12, your devices will now recognise when you’re poking out your tongue. 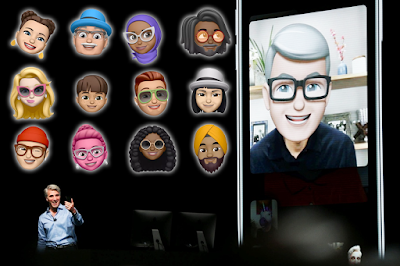 -FaceTime gets a useful upgrade, with Group Facetime, now supporting up to 32 people, simultaneously, across devices. This is shown off with another lengthy demonstration of face chat and another chance to show off those new Memoji’s and the Animoji’s. Apple Watch saves lives. So that’s good. The new Watch OS5 updates the Health App with an Awards system, like Xbox Achievements for your Health App, for reaching milestones. New Runner features are also implemented, such as Rolling mile (how fast you ran your previous mile) and Cadence (how many steps, per minute). The Apple Watch will also now automatically detect when you start a workout, in case you forget to set it, and end of the workout. -Walkie Talkie is an App that sets your phone back thirty years so you can send each other voice messages, in real time… or you know, just call them. -Siri has been upgraded with new shortcuts and third-party App support. Siri no longer requires the need to say, “Hey Siri”... Because apple are always listening. This seems like it might cause a bunch of involuntary activations and phone calls. I thought this was already doable, but Apple have added Podcasts support, from your watch. The future is here. Someone called Jules demos the new features of the Apple Watch, while she gets to work on closing her rings. A pretty cool looking new Pride wrist strap and background are available now. Apple TV has seen a 50% year on year growth. A statistic I found odd as I don’t know anyone with an Apple TV. Could be an American statistic. Last year tvOS brought 4k HDR to the service. This year it adds Dolby Vision and Dolby Atmos. Apple TV is the only player to support Dolby Vision and Atmos... providing you have the hardware required. Any Movies you currently own, through Apple TV, will be upgraded for free, to 4K. Which seems like a decent deal. -Live sports and News have also been added, as well as the ability to stream from certain locations, such as the ISS, so you can watch the Earth from Space. So that should piss off some Flat Earthers. You can also do all this with new controls from your phone. Finally, onto the last part of the conference and, to be honest, there’s not much to say. I wasn’t impressed by any of it. Mac OS. The big news was the naming of OS Mojave (moe-harv-A). -App Store gets a makeover. Not much to say. It's an App store. -Dark Mode which, unless I’m missing something, basically changes the theme, making all the desktop and windows shade of grey. A new Gallery view, with a quick view at the bottom and a large preview window above, for looking at all your pr0n. Metadata (any data related to the picture, i.e. file size, date created…) is also added, in your sidebar. Something Windows has had since 2001. -Voice memos sync from iCloud between your Apple devices. -Home gives you access to thermostats, lights and CCTV cameras, or anything else you may have connected. Allowing you to control your home like Hal 9000. Apple intends to extend protection, to stop apps accessing data and also add a new Ad Blocker that they seem to be making a bigger deal about than necessary like they just invented the thing. All of this is available this Fall (Autumn) and Developer beta versions are available now. They release a great new line! I think we all should read this education blog to be smarter.